Holland chickens are dual purpose birds developed at the Rutgers Breeding Farms in New Jersey,US. They were created with birds imported from Holland crossed with White Leghorns, Rhode Island Reds, New Hampshires, and Lamonas, which created the White Hollands. 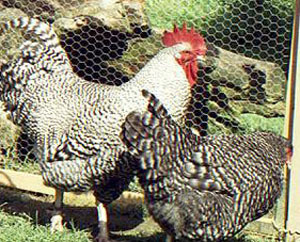 Another cross included White Leghorns, Barred Plymouth Rocks, Australorps and Brown Leghorns that produced the barred variety of Hollands. Both were accepted by the American Poultry Association in 1949. White Hollands have pure white plumage without any other colors. Barred Hollands have black and white barred feathers covering the entire chicken. Holland hens have a darker plumage than the roosters. Roosters weigh eight pounds, and the hens weight six. Holland have a single, red, six-point comb. All six points stand erect on the rooster. The hen's last five points droop. The Standard of Perfection dictates red earlobes for the breed, but most Hollands have white center in their lobe. Medium red wattles dangle from their cheeks. Holland chickens lay white eggs and produce a meaty, yellow carcass preferred by most Americans. Unlike today's egg producers, Hollands thrive in a small farm settings. They withstand confinement well but prefer foraging for their own food. Adaptable, they can live in all latitudes with standard precautions to protect from frostbite. Hollands have a slow growth rate unacceptable in commercial operations but entirely adequate for backyard farmers. Hens go broody when needed and make excellent mothers. Holland are calm and docile with a cheerful disposition. They eat commercial feed but can just as easily forage for themselves. They display few of the irritating traits such as flightiness or aggression seen in other egg layers. They get along with each other in confinement. Quiet, the Holland can live in settings with human neighbors. Hollands need sufficient room to forage for food. Make a large, dry run with available organic feed grains. Supplement their diet with extra protein and calcium to support their egg laying. Provide extra space for nesting. Holland hens prefer raising their own brood. Protect the rooster's comb in the coldest months using petroleum jelly or better yet by providing insulated housing. Hollands face extinction. In fact, the White Holland may not exist. Buy good quality stock from reliable Holland keepers and make the effort to advance the survival of the breed.